By a razor-thin margin, the Senate voted Friday to move forward with a final confirmation vote for Supreme Court nominee Brett Kavanaugh. The Senate voted mostly down party lines, 51-49. The procedural vote starts the clock for final debate on the nomination and sets up the final vote, which could happen as soon as Saturday -- or as late as Tuesday, with Congress off for Columbus Day. The vote Friday started a 30-hour maximum time frame to wrap up debate on Kavanaugh's appointment. After weeks of emotional testimony, Kavanaugh's success or failure hinges on a handful of key Senate voters -- like West Virginia Democrat Joe Manchin, who broke ranks to vote "yes" in Friday's vote and Maine Republican Susan Collins, who, in a 45-minute speech on the Senator floor, said she would vote "yes." Senate Republican leader Mitch McConnell is estimated to have 51 senators who will vote to confirm Kavanaugh. If there is a 50-50 tie, Vice President Mike Pence will cast the deciding vote. Collins and Sen. Jeff Flake, R-Ariz., who called for the FBI investigation, are considered key votes. Speaking on the Senate floor Friday, Collins said that though she found testimony by Christine Blasey Ford painful and compelling, there wasn't enough evidence to convince her that Kavanaugh more than likely assaulted her at a party in 1982. "I do not believe that these charges can fairly prevent Judge Kavanaugh from serving on the court," she said. Shortly after her speech, Manchin tweeted his support for Kavanaugh. "I have reservations about this vote given the serious accusations against Judge Kavanaugh and the temperament he displayed in the hearing," he said in a statement. "And my heart goes out to anyone who has experienced any type of sexual assault in their life. "I do hope that Judge Kavanaugh will not allow the partisan nature this process took to follow him onto the court." 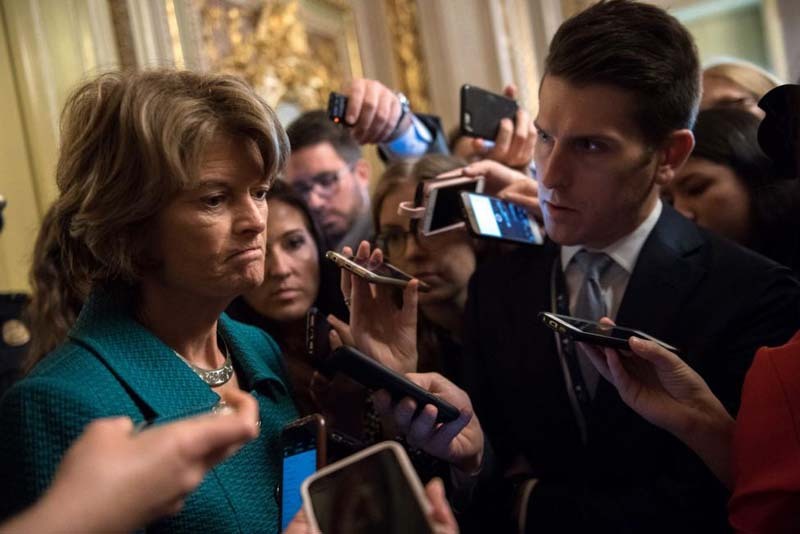 On Friday evening, Sen. Lisa Murkowski of Alaska became the lone Republican to break with her party, saying she was against Kavanaugh's nomination. She said that though she "will be a no tomorrow," she will vote "present" out of respect for Sen. Steve Daines, R-Mont., who will not be able to attend the vote because he will be at his daughter's wedding. "I believe that Judge Kavanaugh is a good man ... But in my conscience, because that's how I have to vote ... I could not conclude that he is the right person for the court at this time," she said on the Senate floor. Thursday, the full Senate had the opportunity to review the FBI's investigative report into accusations of sexual assault by Kavanaugh from two women during their high school and college years. The conclusions in the report, which was not made public, did not provide concrete proof of wrongdoing. Republicans said the report shows Kavanaugh's nomination should proceed and Democrats said it was too limited in scope and should be made public. Complicating matters is the fact that Sen. Steve Daines, R-Mont., will be at his daughter's wedding Saturday so he could miss the vote or force a delay. Friday, President Donald Trump again tweeted support for his second high court appointee. "Very proud of the U.S. Senate for voting 'YES' to advance the nomination of Judge Brett Kavanaugh!" his tweet read. "Honestly, I think a lot of Democrats should change their mind and do the right thing and [confirm] Judge Kavanaugh," White House press secretary Sarah Sanders told reporters Friday afternoon. In an op-ed Thursday in the Wall Street Journal, Kavanaugh again defended himself against the accusations. "My time in high school and college, more than 30 years ago, has been ridiculously distorted," Kavanaugh said. "My wife and daughters have faced vile and violent threats." He also said he was "very emotional ... more so than I have ever been" when he testified before the Senate judiciary committee last week. "I know that my tone was sharp, and I said a few things I should not have said," Kavanaugh said. "I hope everyone can understand that I was there as a son, husband and dad. I testified with five people foremost in my mind: my mom, my wife and most of all my daughters." If appointed to the Supreme Court, Kavanaugh said he would continue to be the same even-keeled, open-minded and independent judge he's been for his 28-year legal career. Retired Supreme Court Justice John Paul Stevens said Thursday that Kavanaugh is not qualified to sit on the high court because of prejudices revealed during his Senate testimony. Stevens, 98, who retired from the court in 2010, initially supported Kavanaugh. "They suggest that he has demonstrated a potential bias involving enough potential litigants before the court that he would not be able to perform his full responsibilities," Stevens told a group of retirees in Boca Raton, Fla., The Palm Beach Post reported. "I've changed my views for reasons that have really no relationship to his intellectual ability or his record as a federal judge. But I think that his performance during the hearings caused me to change my mind." Stevens recalled the similar controversy surrounding then-nominee Clarence Thomas in 1991, saying Thomas didn't do anything to disqualify himself during Senate hearings. Thomas was ultimately confirmed, and he and Stevens often disagreed in their opinions. "You cannot help but like Clarence Thomas, which I don't think necessarily would be true of this particular nominee," Stevens said. Kavanaugh's controversial nomination has drawn hundreds of protesters to Capitol Hill -- more than 300 of whom were arrested Thursday.